As the leading voice for Ohio airports, OAA regularly monitors our members’ needs, concerns, and opinions. The OAA Advocacy Committee monitors and takes action on legislative and regulatory issues that can affect our airports and aviation community. For a one-page Public Policy Agenda summary, click here. We develop our public priorities through a consistent and ongoing process that begins with member input and policy analysis. The committee is comprised of OAA board directors, members, and volunteers with public policy experience and aviation interests. The Advocacy Committee studies public policy options from differing viewpoints and weighs the opinions of members, staff, and policy experts and then submits advocacy recommendations to the board. Once approved, the committee works to implement those policies in conjunction with grassroots efforts that rely on OAA members contacting and educating local legislators and officials. At the state level, OAA works to affect legislation that reflects these policies by lobbying the state executive and legislative branches while working in conjunction with regulatory agencies. Directors of the OAA Board, along with members and volunteers, regularly testify during committee hearings and attend meetings to advance our strategic priorities. There is no denying that the aviation industry is a vital part of Ohio’s economy and is an essential part of everyday life of Ohioans. Our airports play a critical role in ensuring the state’s ability to attract, generate, and maintain business and employment. Airports are global gateways that allow companies the ability to establish operations, move people and cargo seamlessly between locations, and connect business with tourism. It’s our job to make sure that Ohio’s multifaceted airport system across the state remains competitive in an increasingly global economy. As a result of a 2015 opinion from the Ohio Attorney General's office, airports operated by a port or airport authority were not able to obtain legal assistance from a county prosecutor in their territory. Prior to that opinion, several airports across the state did obtain legal assistance from their county prosecutor. Once word reached OAA, we began working on a fix that would grant airports access to legal services through their county prosecutor. House Bill 34 does not place any restrictions on the types of issues that a county prosecutor can assist on—it will be up to the prosecutor to decide whether or not he or she is comfortable providing assistance. HB 34 does not limit assistance to only aviation-related matters; it can be any issue that a port or airport authority is dealing with. If you have any questions please do not hesitate to contact OAA leadership. As a result of recent hard work and coordination with the State of Ohio, OAA was able to increase the funding for the Ohio Airport Grant Program to $6,000,000 per year in the 2016-2017 state budget. As you know, the program had not seen an increase in quite some time and the funding allocated was stretched to cover both Ohio Department of Transportation Office of Aviation operating costs and the grant program. With these increased funds, the state was able to grant funding for an additional 26 projects at 24 airports throughout the state. This increased funding represents a 900% increase over the last few years allowing communities and areas in meeting their infrastructure facility needs. In monitoring legislation, we were able to quickly identify HB 237 which sought to regulate transportation network companies and the services they provide. As the bill stood, the original language prohibited airports from regulating or assessing fees on the transportation network companies that operate at airports. Since we are required to be self-sustaining by the Federal Aviation Administration and we rely on fees for the bulk of our revenue, the inability to establish fees would have harmed airports. OAA members, staff, and our legislative consultants worked with the bill’s sponsors and representatives of the transportation network companies to create a friendly amendment before it passed which grants airports the ability to collect fees similar to those assessed on taxi cabs and livery companies. It also allows airports to adopt sensible regulations and standards for those transportation networks operating on their property. Had we not been paying close attention, it is likely that a new law would have gone into effect and that would have resulted in a loss of revenue to airports and the aviation industry. To improve the ability of an airport and port authority to conduct their public business, OAA worked with the 131st General Assembly to grant members of an airport authority board of trustees or port authority board of directors the ability to attend meetings via teleconference or interactive video conference beginning in 2017. To utilize this flexible business operation, an airport authority or port authority would first need to adopt rules specifying the minimum number of members that must physically attend a meeting, geographic restrictions for members seeking to attend meetings remotely, and the process for distributing meeting materials in advance of a meeting. The Bill, most importantly, maintains that all meetings continue to be open to the public and that a physical location is identified for members of the public and media who wish to attend the meeting in person. The recent passage of this Bill protects the ability of everyday citizens, members of the press, and other stakeholders to observe the action of the government while improving the flexibility of how public airport business is conducted. OAA works hard to represent you and ensure the economic vibrancy of our airports. 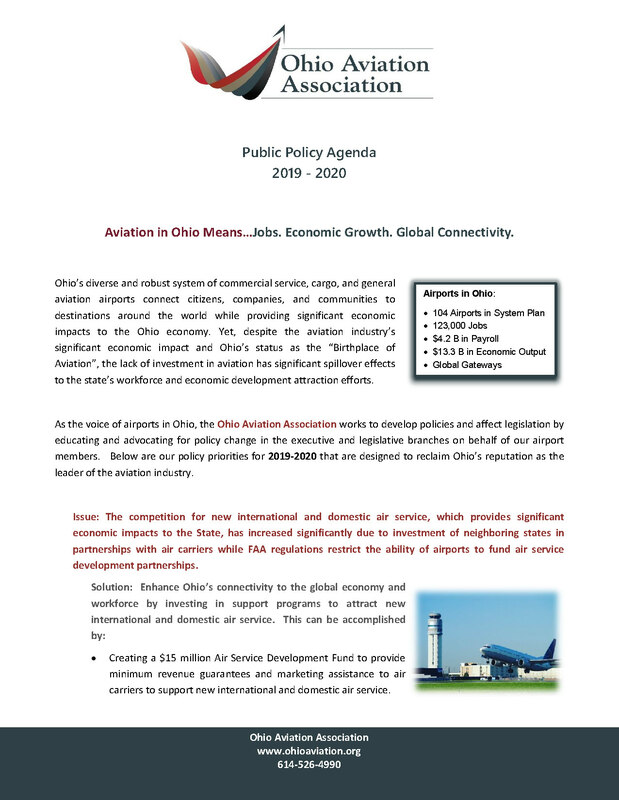 Reach out to us for assistance if you are finding a situation in current or proposed government policy is making aviation business in Ohio challenging. We want to ensure that the State's airport system remains competitive in an increasingly global economy.